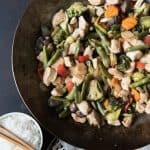 This Easy Chicken & Vegetable Stir-Fry is one of our go-to meals when it comes to easy weeknight dinners. Lots of tender crisp veggies and chunks of seared chicken are combined in a classic stir-fry sauce for an excellent, healthy dish your whole family will enjoy! Cut chicken into small, bite-size chunks. Season with salt & pepper. Prepare all vegetables before beginning to cook by chopping into bite-size pieces. Heat wok or large frying pan over medium-high heat. Add 2 tablespoons of oil. Once the oil is hot, add the chicken and let sit for 2-4 minutes without moving before stirring to coat the chicken with oil. Saute until the chicken is just beginning to brown, but don't worry about cooking the chicken all the way through yet. Remove from wok and set aside. Add remaining 2 tablespoons of oil to the pan and when hot, add the white part of the green onions and the minced garlic, stirring just until fragrant, about 30 seconds to 1 minute. Add the vegetables (or any combination of vegetables you like, aiming for 4-6 cups of total vegetables) and season with a little salt. Stir fry for about 10 minutes until veggies are tender but still crisp. If the pan gets too dry, add splashes of broth or water as needed so the vegetables don't burn. Return the chicken to the wok with the vegetables and stir together. Push to the outer edges of the wok to create a clear space in the center. Add the stir-fry sauce and wait for it to bubble and start to darken a bit before tossing everything together to coat in sauce. Continue to cook until all the vegetables are tender and the chicken is cooked through. Serve with rice, sprinkling the stir-fry with the remaining green tops of the green onions and chopped peanuts for garnish.